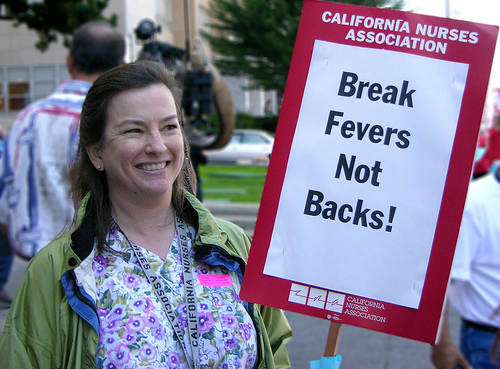 The California Nurses Association/National Nurses United today praised the decision by California Gov. Jerry Brown to sign an important workplace safety bill to protect registered nurses and other healthcare employees from disabling injuries and safeguard patients from preventable falls. AB 1136 (Swanson), sponsored by CNA/NNU, requires all California hospitals to have a safe patient handling policy, including “lift teams” trained to move patients using proper lift equipment. Earlier versions of the bill were vetoed by former Gov. Arnold Schwarzenegger despite a virtual epidemic of debilitating injuries to nurses, other health workers, and patients linked to lack of safe policies. CNA/NNU and RNs worked hard to pass the bill against substantial opposition from the California Hospital Association, one of the largest and wealthiest corporate lobbying firms in Sacramento. A handful of other states have passed patient handling legislation, but the California law is believed to be the strongest in requiring hospital compliance. Bureau of Labor Statistics data in 2008 documented that nationally, 36,000 healthcare workers were injured by lifting and transferring patients. Nurses endure more work-related musculoskeletal injuries than truck drivers or construction workers – and California leads the nation in the number of musculoskeletal injuries. Nursing surveys have found that 83 percent of RNs work in spite of back pain, 52 percent report chronic back pain, and 12 percent who leave the profession say back injuries were the main, or a major, reason for leaving the RN workforce. “California’s nursing workforce is aging at the same time patient acuity and obesity are rising. Manual lifting can injure fragile patients by putting too much pressure on sensitive joints and compromised skin. This is a great step forward to protect our nurses and other healthcare workers from injury, and provide patients with safe and appropriate care,” Castillo said. Hospitals that have lift teams in place have seen a significant drop in such injuries.